Cyclists in the City: City of London proposes to 'encourage' people NOT to cycle in the Square Mile and to cleanse it streets of bicycles by sending people through Hackney and Islington instead. Space for people on foot. Space for people in taxis. No space for people on bicycles? City of London proposes to 'encourage' people NOT to cycle in the Square Mile and to cleanse it streets of bicycles by sending people through Hackney and Islington instead. Space for people on foot. Space for people in taxis. No space for people on bicycles? but at least there's room for people to cycle here. The City of London has published some 'Area Strategies' recently that have been sitting in my inbox for a couple of weeks. I should have looked at them sooner. These Area Strategies represent sizable chunks of the Square Mile. And they look, to me, like a recipe to eliminate cycling from the City of London. As I say this, I should point out that I have to be slightly careful. I am meeting the new team responsible for the City of London's streets in a few days' time. From what we've discussed so far, they do genuinely intend to create conditions to make cycling safer and easier through the City of London. On the one hand, I don't want to alienate those City of London officials. But on the other, the scale of what's proposed is so ghastly, that I feel I have to bring these points to wider attention. The reason is that the Area Plans read as if cycling is to be simply removed from the City of London. lorries and taxis that can't get past you, nor you past them. What makes me think that? Very specific, really. The City of London plan for the area around Liverpool Street is to "Review the current hierarchy of cycling routes, and explore the possibility of encouraging alternative routes through the quieter streets of Hackney and Islington." Yes, you read that right. The City of London Area Plan - and remember that these schemes all involve spending millions of pounds - is to bump cyclists off into other boroughs to deal with. Still not convinced? Let's look at Moorgate. What's the plan here? The plan is to "Widen pavements and consider ways to rationalise vehicle, cycle and bus traffic within the roadway in order to create a calmed environment for all road users and pedestrians". No harm in that, you might think. Moorgate is a horrible street to walk along. It's deeply deeply horrible to cycle along too. The reality, though, is that this means it will be virtually unusable on a bicycle - the road will be too narrow to get safely past the stacks of buses and taxis that clog this street every rush hour. There simply won't be anywhere to go. What's the plan at Bishopsgate? Yes, you guessed it: "Review the allocation of space to the footways, bus stops, roadways and central reservations, considering the current dangers for cyclists and the congestion caused by buses, both on the carriageway and around bus stops outside Liverpool Street station." Fair enough, perhaps. The road is horrible for pedestrians. But it's a downright death trap to cycle along. Earlier this year, a well-respected, hugely experienced cycle courier was killed cycling here. All of this information comes from the City of London's Area Plan consultation pages. The City is asking for feedback. be space to cycle in, now there is none. If you have time and patience, you can trawl through around 50 different PDF documents and then politely point out why you think these schemes aren't positive news for safer cycling. Personally, I don't suggest you bother. The tragedy is that I do agree with the City of London's plans to make conditions more agreeable for pedestrians. There is massive pedestrian footfall here. But I fundamentally disagree with closing the Square Mile to people who want to travel from A to B by bicycle by narrowing all the main roads and by not providing useful, direct, safe alternatives. The Liverpool Street Area Plan talks of the need to 'Review the current hierarchy of cycling routes'. Yes, spot on. But there is no such thing as a current hierarchy of cycling routes in the City of London. If there were a decent network of cycling routes through the City, then it would make sense to prioritise some routes for pedestrians, some for cycling, others for motor vehicle throughput. But the Area Plans lack a vision for cycling in the City of London, other than a vision which shunts cyclists into Hackney and Islington, and do not (yet) propose any sort of cycle network through the Square Mile. As such, each of these Area Plans will come together with the combined effect of making it near impossible to cycle safely and directly through the City of London. That is, unless the City of London plans to create a network of routes where cycling is prioritised above through motor traffic. There are tiny stretches through the City where these routes almost, exist. Such as the quiet route from Smithfield Market to Blackfriars. But they don't join up. And no-one in the City of London looks at them and even realises they have the beginnings of a cycle network to build on. The City of London needs a network of safe, direct routes for people to travel from A to B by bicycle that head east to west and north to south. My fear is that the Area Plans as they stand, take absolutely no account of routes that people want and need to cycle along. And as such, combined with a philosophy of 'encouraging' people not to cycle in the City of London, we can kiss goodbye to safe, direct routes for people to cycle. There are tens of thousands of people who cycle into or through the City of London every day. Some of those 'cyclists' are fairly senior people. It's time that some of those senior City of London folk started to stand up for cycling. Whether they like it or not, cycling has become a political issue in the Square Mile. It's rediculous. Please fight the case - better yet get them on some bikes at 8.30 on a work day morning and see what its like (and - heaven forbid they try the crossing next to the bank of england which had locog seen before they built the bmx stadium would have fitted the bill nicely with its exciting bumps, dangerous turns and blind corners). Dear everyone, please feel free to use some of the following when you write to bankarea@cityoflondon.gov.uk or fenchurchmonumentarea@cityoflondon.gov.uk or liverpoolstreetarea@cityoflondon.gov.uk. Thanks for the chance to comment on your proposed street improvements. 1. Your proposals do not sufficiently consider cycle safety and are likely to cause deaths and injuries to people who want to cycle to their jobs in the City. 2. You have not reflected on which aspects of other changes you made to other City streets were successful and which were not. 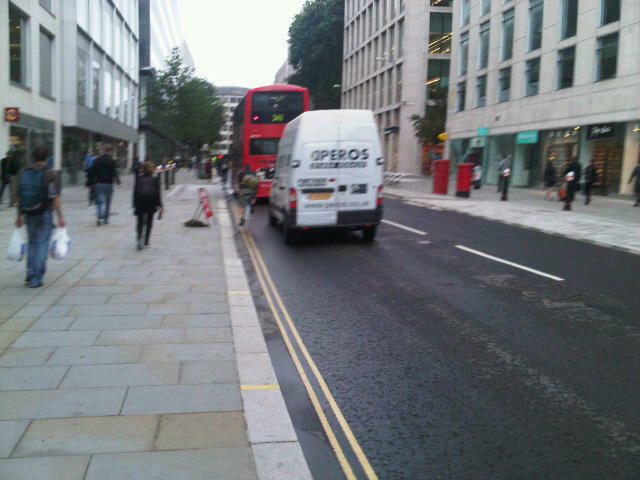 In Cheapside for example, you removed a cycle lane; this made cycling along that street feel less safe. As a result, I am more likely to choose to take a taxi or to drive if my route takes me through that area than I was before. 3. You recommend shared space (similar to Exhibition Road in Kensington) for some areas. But Shared Space is not appropriate unless motor vehicle throughput is extremely low, such as streets closed off to through traffic. Even with a modest numbers of motor vehicles, walking or cycling is intimidating and dangerous in shared spaces. If you are unsure about this, try crossing the road as a pedestrian in the through-road section of Exhibition Road. Contrary to expectations, most drivers of motor vehicles do not give way to pedestrians. 4. You have not forecast transport demand by mode. Cycling is growing much faster than other modes of transport. 5. You do not take modal shift into account when you redesign roads and junctions. If you make life easier and safer for pedestrians and cyclists, removing conflicts between motor vehicles and other road users, then people are encouraged to switch from motor vehicles to bicycles and pedestrian modes. This has the effect of reducing congestion as people switch to more space-efficient modes (as well as improving health). 12. At left turns, place kerbs between bicycle lanes and motor vehicle lanes to reduce conflicts between bicycles and left-turning motor vehicles. This is fantastic and very well argued. Many thanks. I've copied it and sent it off to the relevant emails you listed. Massive time saver! I hope you are wrong about quite a lot of what you write in this post, Danny, in particular your point about the narrowing of roads. At the City of London Cycle Forum, it was reported that this had been tried before, and not with any great success. My impression, like yours, is that cycling officers do genuinely intend to create conditions that would make cycling safer and easier. I was therefore surprised to read about the pavement widening, and also what you said about networks. For example, the route from Smithfield Market to Blackfriars Bridge is known to cycling officers, and is being looked at, along with all the other routes that appear on this map (at least as far as I understand it). "I would concur that, regardless of the legal niceties about the differences between blue paint/smurf lanes, advisory cycle lanes, mandatory cycle lanes, segregated cycle lanes etc., cyclists will regard dedicated cycling facilities of all types as their bit of space, analogous to footways for pedestrians; that this is natural and reasonable; and that policy and design work needs to recognize and work with this tendency rather than against it. I would also concur that higher levels of compliance with traffic laws applying to cyclists will only likely come about when a cycling environment is provided that allows people to cycle in safety and comfort, rather than one that strongly favours the young, the fit and the confident. I hope I'm justified in saying that we are finally starting to work towards this." Please let us know how your meeting with them goes on. I was at the same Cycling Forum, and while at one stage it was indeed admitted that Cheapside didn't work because they didn't understand how cyclists would react to the changes, towards the end of the meeting one of the councillors nevertheless said that in the future we could look forward to "more schemes like Cheapside", or words to that effect. And that's exactly what these new proposals are. More road-narrowing, pavement-wideing, cyclist-excluding nonsense. They haven't learned any lessons from Cheapside. In fact I suspect they are institutionally incapable of learning lessons. The officers may have the right ideas but the councillors are stunningly ignorant about cycling or basic concepts of road design, and extremely complacent to boot. It's a fundamentally dysfunctional organisation. What the City of London don't seem to get is that people don't cycle there for the fun of it: they cycle there because both driving and public transport in the area are slow and/or expensive. That's the main reason cycling has grown so fast, and the reason why it will continue to grow. Making the environment unpleasant for cyclists won't scare most of them off - it's already appalling and there are still floods of cyclists every day. If it was capable of thinking clearly about the issue, the City would realise that it has to fundamentally change how its streets work to accommodate the people who are choosing to cycle there, or accept that casualties will continue to rise. The proposals set out here are the equivalent of sticking fingers in your ears and saying "la la la I can't hear you". It is a total failure of governance. Incidentally, the suggested letter by Anonymous above is superb and I hope lots of people send something similar in - I know I will. Perhaps someone needs to point out that fit and confident cyclists will be quite rightly cycling along the narrowed roads, effectively blocking all motor traffic. Now perhaps this is "traffic calming through cycling" but I'll bet it's not what City of London had in mind. This will be bad for motor traffic as well as cyclists. Encouraging people to use safer routes nearby is only part of the mix. The City has 320,000 people crammed into one square mile and if somebody can easily avoid it why not? Despite the medieval street structure we're launching a consultation into more 2-way cycling down one way streets on 9 October -have your say. We haven't always gotten it right but we are listening and we are trying. Have your say from 9 October. A "medieval street structure" should provide all the more reason to prioritise walking and cycling in the City. If space is limited, then surely the most sensible policy is to shift people onto bicycles for short journeys. Yet - judging by the consultation - the City has no interest in doing this. It's removing what limited facilities there were for cycling, and also telling people on bicycles to go elsewhere. This is madness. How about trying to reduce the volume of private motorised traffic in the city, by providing people with a safe and pleasant alternative? That should be the real priority for an area with narrow streets, not continued accommodation of the current amounts of motor traffic. London's street layout recieved a revamp after the Great Fire. Whilst not on the scale envisioned by Wren or Evelyn, it did experience widening and straigtning of most of the streets (as well as general imporvements for hygene and fire safety), pretty much in line with early modern conventions. If it were genuinly medieval, it would be very difficult to drive around, and would likely be a cyclists paradise, much like those car free genuinly medieval town centres you find on the continent. If you are 'listening' and 'trying', why even consult on new proposals that are clearly hostile to cycling (as has been made clear by many parties since the Cheapside rebuild)? Why not come up with street designs that are safe and easy to use for people on bikes, and encourage cycling, first time around, and consult on those? What I see at an operational level is City officers – cycling officers and highways/planning – working conscientiously to make the small improvements which are possible within the authorities and budgets they have available to them. Certainly, the City is ahead of RBKC on introducing cycle contraflows, although RBKC to be fair is getting going on that, and it is several light years ahead of Westminster, which basically seems to be totally toxic when it comes to cyclists. There are also some good examples of filtered permeability such as Cursitor St, Breams Buildings, St Andrews Hill, Blackfriars Lane. Also, to be fair, Streets & Walkways committee members are reasonably sympathetic. Where things seem to break down is in the higher levels of officialdom – director of built environment – and in the Policy & Resources Committee which is very influential and, by and large, seems to be a complete dinosaur. I am sure that I am one of many who has been banging on til I am blue in the face how crap Cheapside is for cyclists, and how I hope we don’t have a repeat of that fiasco. It seems to me that people have not responded to Cheapside in the way expected, and I don’t think it is the cyclists who have not performed to expectation. Rather it is that the design was supposed to discourage private car drivers/taxis etc from using the street at all, and to go around via Queen Vic St. Part of that strategy was rather revealingly admitted by the designers at a seminar, according to reports I read, as using cyclists as rolling speed humps, and the same designer used the same strategy in Ken High St. It hasn’t worked. It's a good question that Anonymous asks. The problem is, I think, we're not properly having "the discussion". Were we to do so, then the City of London would surely be presenting the public with a range of design options, with the pros and cons of each simply and honestly explained. People could then give an informed decision as to their preference. If we are really to learn from best practice, it is important to recognise that the bicycle must be regarded as a mode of transport in its own right. We might also take note of the fact that street space, like any other limited resource, has to be shared. I understand that the City has a medieval street structure, but even so, the City of London website says that a busy road in the Square Mile carries approximately ten thousand motor vehicles per day. Comparatively, a 3.5 metre-wide two-way cycle track could carry 14,000 bikes per hour! Given that, according to 2010 figures, cycle traffic in the City makes up 16.4% of all road movements - making it the second or third most popular cycling destination in the whole country - it is difficult to understand why so little is actually being done to meet cyclists' needs. What I find truly amazing, however, is just how mute many of the major employers are. I once conducted an experiment with some friends of mine, and we showed that, even at one o'clock in the afternoon, the bicycle was still 85% quicker than the 'Drain'. Added to which, if people cycled this route rather than using public transport, they would gain an extra six years of life! Truly, you can only wonder what else it would take for people to sit up and take note. @ Paul M: "What I see at an operational level is City officers – cycling officers and highways/planning – working conscientiously to make the small improvements which are possible within the authorities and budgets they have available to them." I think I can offer an explanation for the muteness of major City firms on this topic. I am a partner in a Big 4 accounting firm, and I know for a fact that many of my fellow partners, including some who are much more senior than me in the hierarchy, are keen cyclists and quite a few are also cycle commuters (you should see the bikes they rided!). The problem is health & safety, or employer's liability, or something along those lines. We would embrace cycling as a mode of transport, but the fear is that staff would risk injury and the firm could find itself liable. Or staff could cause an accident which brought down a thirsd party claim on the firm if the staff were travelling on firm's business. I guess the answer is insurance, - we all know that the net benefit, with health factors, favours cycling - but who offers such insurance? It comes as part of the deal with cars, but not with bikes. I'm afraid you're going to have to call them on that one as it's total corporate flim-flam and BS. If a company pays attention to the needs of its staff, or acts to reduce risks for them, how does it make it more liable for any injuries that occur outside of the office. The answer is it doesn't. For example, if a company sees that lots of their staff are arriving by bicycle and therefore provides parking, changing facilities, etc for these staff - does this make the company any more liable? No of course it doesn't. Extending it beyond the office, a company sees that lots of their staff are arriving by bicycle, but identifies risks of their staff getting injured because of poor policy/ road design by the local authority in the area. If the company use their influence with the local authority to get improvements made would this make the company more liable? Of course not. The company would in fact be working to reduce identified risks for their staff - you only have to see the earlier post on this blog about the army's insistence that proper cycle lanes are installed in Catterick to see how this works. And in respect of cyclists travelling on company business by bike, third part cover for cyclists is easily added to the insurance that a company would already need to take out to cover the activities of it's staff - two of my previous workplaces had specific policies in place to allow for this. Sure, if the company is providing the bicycles for their staff to ride then there might be an issue but in almost all instances this is not the case. I'm afraid it's down to whether you and your fellow cycling partners are making enough noise for your company to start considering paying a role. I am guessing you have a regional office in Holland - maybe you should give them a call and see how they do it? But Paul, I am not talking about employers encouraging their staff to cycle to work as things are currently provisioned, I am talking about employers encouraging the City authorities to do more for the bicycle - much more - given the many and obvious benefits attached to the use of the bicycle in the built-up area. Sorry for not making myself clearer. To anonymous - you clearly have absolutely NO IDEA how large organisations are run. Paul, I have never worked for a large organisation, and I have absolutely NO IDEA how they work either. I presume what is holding them back from saying anything publicly would be a reluctance to involve themselves in the politics of this, but then again, they have so much to gain from the creation of a network of routes which would enable their staff to cycle into work. Like I say, we're not properly having "the discussion". If what you mean is that I have absolutely no idea how the politics of your company play out, then you are absolutely correct. However, I have seen how the politics of large organisations work (or rather don't work). I also have a reasonable idea about risk and liability, which is what you were saying was the primary obstacle to meaningful action in your company. If it isn't about risk but is instead about typical large organisation political inertia and territorial BS then the answer is clear. Change will only come about when somebody sticks their head above the parapet and starts challenging the status quo. Is that going to be you? Yes, it is going to be me, It has been me for the last 4 years. I am not alone but I am in a small minority who care enough to stick our necks out. My organisation is in may ways more enlightened about cycling than most city businesses but there are various legal, commercial and political factors which make them reluctant to take a public position on this, and in that respect they are no different from any other big City institution. I know of keen advocates who are top figures in other major firms, including one of the largest UK law firms, but they also cannot, or are unwilling presumably for the same reasons to take a corporate position on this. Please don't pontificate about that of which you clearly know nothing. I live in south London, how am I going to cycle into work in square mile via Hackney/Islington!??! Cycling in the City of London is currently so dangerous and uninviting that I don't imagine any more than 1% of the cycle journeys currently made daily though the City of London are 'through-traffic'. The vast majority of Londoners, if making a journey East-West will use more cycle friendly routes either north through Bloomsbury or south through Southwark. Or, most likely, they won't use a bike at all. The City of London's current cycle traffic is made up almost entirely of the 320,000 people you mention that are crammed into the one square mile. These cyclists can't 'easily avoid' the City since they live and work there! Therefore, any policy of encouraging cyclists to use routes outside of the Square Mile is inherently flawed because the vast majority of those that cycle in the Square Mile either start or finish their journey there meaning that no diversion is possible! I'd wager that there is still plenty of 'through-traffic' by taxis and motorists though! If you really want create space inside the Square Mile it would be much more worthwhile to look into measures that would divert this automobile 'through-traffic'. Lots of interesting points here - thanks. Can we be clear about one thing though? Claiming that the City wants to ban cycling is a great story and something dramatic to say down the pub, but it’s just not true. To take one idea (alerting people to quieter routes near extremely congested ones) in a consultation and say we're trying to ban or discourage cycling across the Square Mile is clearly ridiculous. We are not trying to discourage or ban cycling. We are not trying to stop people cycling to work. We are not trying to stop people cycling around or through the City. You're not doing anything to help, so don't play the victim. The fundamental issue is that you're not willing or able to make the main streets safe so you're hoping that cyclists will make themselves less of a problem by cycling on side streets or in other boroughs instead. But this misunderstands why people cycle on main streets in the City. They don't do it because it's fun or pleasant, they do it because these streets offer direct routes to their destinations. Asking them not to cycle there is asking them to take a more circuitous route, and most of them won't do it. So you can either make those direct routes safe or do nothing and watch the casualty numbers climb. In short, you can't control where people choose to cycle - but you can control whether they cycle in safety or not. Can we stop shooting the messenger please? Whoever is responsible for this (and I could name names, but won't) it is not the mid-level officials in the City Corporation. I was assuming G Simpson was a CoL politician but having checked I see he isn't. So you're right, and I apologise if I was harsh. One of the things I really don't understand about these plans, is the use of wider pavements to narrow carriageways. I understand that narrowing the road can be a good way to reduce vehicle speeds, as it means there's less room for overtaking, and people tend to drive more cautiously. But if that's your aim, why not use a decent bike lane as the means of reducing that space, rather than wider pavements? Where this has been implemented in the past, there are often no benefits for pedestrians as the increased pavement space is given over to bins and street clutter, so people tend not to walk there anyway. Plus, a narrower carriageway with no bike provision is more likely to result in close passes or pavement cycling, thus increasing antisocial behaviour. Most of the people who cycle through the City aren't doing it for fun, they're doing it to get to work. If you start planning decent routes for them, you'll see congestion fall. If you continue to ignore them, traffic will only get worse, and council officers will continue to have to explain to councillors why the expensive schemes to reduce it haven't worked. "We aim to deliver sustainable solutions that provide social, cultural and economic gain to local communities and businesses based on consultation, focused strategies, innovative designs and achievable programmes for implementation. We recognise the need to protect the environment and to use resources in a way that provides for future generations and we promote sustainable design and procurement in both the consultancy services that we provide and our day to day management of the company." 3. Cyclists will stop riding on these roads. I see that Freewheeler has entered the fray on the subject of pavement widening, in his usual uncompromising and compelling style. He writes: "Plenty of us have worked out what needs doing to truly transform this big, sprawling city into one where cycling is safe, convenient and attractive and where modal share would be massive." Is this right? Presumably there is no disagreement on the need to take an holistic approach (i.e. to think in terms of a network)? I ask because even this much does not appear to me to be certain. Anyway, assuming this is agreed, I suppose we would begin by planning which routes should form part of the cycle network. Next we would study the feasibility of incorporating these routes into the network, including all sorts of assessments, such as: what sort of road is it? what role should it play within the road / cycle network? how much would it cost to bring it up to standard? what would it look like when it was finished? when would this work be undertaken? Then what do we do? Introduce the network all at once? Or one piece at a time? I don't know, and I have hardly read a single blog about it. As bikemapper says, "We're not properly having 'the discussion'". Tom, I think the issue in the city is there is no 'network' nor any such network planned. If there were, then it might be acceptable to start narrowing some streets and optimising other routes for safe, convenient cycling. But that's not happening. All that's happening is main through streets will be narrowed and various one-way side streets will be made two-way for cycling. But as yet, those don't join up, they certainly don't prioritise cycling or think about linking together to make routes capable of handling more than a handful of people on bikes. "This is great. Just what we need to make cycling safer in London. "I love Simon Parker’s London Cycle Map idea. Is this going to be taken up, and discussed whilst promoting continental-standard infrastructure in the capital at the Conference?" If the LCC are at all sincere in their claim to be the voice of cyclists in London, then they have to reflect the female point of view as well. I think I read somewhere that more than 40% of the signatories of the LCMC petition are women. Just because the MAMILs know how to navigate their way around safely, it doesn't mean everybody else does. We need to 'normalise' cycling, and we can only do this by broadening its appeal. For myself, I hope the LCC are prepared to go beyond their current demands, which, if we're honest, amount to nothing more than snippets. Surely it is beyond dispute that a network, any sort of network, is better than no network at all. A network, by its very definition, is joined up. Let's have joined up, and let's have holistic. It is also surely beyond dispute that if we can have proper 'backbone' routes on this network, so much the better. But if, for whatever reason, this is not possible in the short-term, we ought not to discard the whole just because a few parts of it may not currently be satisfactory. In other words, we don't throw the baby out with the bath-water. That's not just stupid, it's pig-headed as well. This conference represents the best chance for the cycling community in London to properly have "the discussion". Let's hope this opportunity is not wasted. You point out that the issue is that no network is being planned. Why is this? The LCC said recently that the good news from the Mayor's first 100 days is such-and-such, but "the not-so-good news is that we still don’t have a plan". I didn't realise that this is the way that campaign organisations work in this country. I would have thought that the thing to do would be to have a clear idea what you would like to achieve - as was the case with the LCC in the late 1970s, for example - and then campaign for that. Why aren't the LCC calling for the development of a cycling network? It would surely help the Mayor, TfL and the boroughs to know that this is what is wanted. This quick and relatively low-cost network uses proposed / existing cycle lanes and traffic-calmed roads to cross the heart of London and connect the arrival points of the Cycle Superhighways. "It's already been designed; it's not a fanciful idea." As things currently stand, cyclists using these commuter-friendly routes simply disappear into the 'black hole' that is the current central London ‘non-network’. It's a crazy situation. The BikeGrid is a realistic project that could transform swathes of London from noisy, grubby car alleys into open, safe and cheerful public spaces. Remember that Zone 1 is principally an area for commerce, shopping and tourism. The LCC say that TfL has been positive about the BikeGrid project, and that they hope to work with them to progress this idea further. "What cyclists need now, and what London needs, is the green light from our cycling mayor to make this essential and overdue project a reality." Commenting on the presentation of the proposals, LCC chief executive Koy Thomson said, "We've given them a detailed plan for free. Let's hope they do all London cyclists a favour and adopt it wholesale." The Mayor said at the time that he was "particularly interested" in these proposals. Over a week before londonneur published his cycle plan, Rachel Aldred told the GLA's Investigation into Cycling that segregated routes should form the backbone of a network that is suitable to people of all abilities. In fairness to londonneur, he has given us a clearer idea what these 'backbone' routes might look like, but substantially he is saying the same thing. And what about the rest of the city? "The schools are key," londonneur says. This is as maybe, but there are over 2,200 schools in London, and providing links to all of these, particularly ones that could be used by children, would be a massive undertaking. Personally I think he is getting a little bit ahead of himself here. Anyway, the main thing seems to be that people are agreed on the need to develop a comprehensive, city-wide cycle network. That is correct, isn't it? I mean, CTC, LCC and CEoGB are all as one on this, right? Assuming this is so, you ask who should be drawing up this network plan. Most of the network would be on borough roads, so the boroughs have definitely got to be involved; some of it would be one the TLRN, so TfL need to be involved; and some of it is going to be in the parks, maybe alongside the canals, so the relevant authorities here would need to be involved as well. These are going to be the major players in this, for sure, and according to Ben Plowden's testimony, if TfL are not already on to this, they will be soon. Now, once the boroughs and TfL have have identified which routes should make up this network, I am confident that I would be able to code them using compass colours. Maybe there is another way of coding these routes, and maybe even it would result in a simpler, more logical, more self-consistent and more elegant solution than I am able to provide. Bad luck me. But we need to start having a real good look at this, and to start getting down to the detail. My proposed network design is based on the LCN / LCN+ / Cycle Superhighways, and can be seen here. To see how closely it aligns with the the proposed cycle network for the City, say, please click here. But still Tom's final question remains unanswered. Should this network be introduced all at once, or one piece at a time?